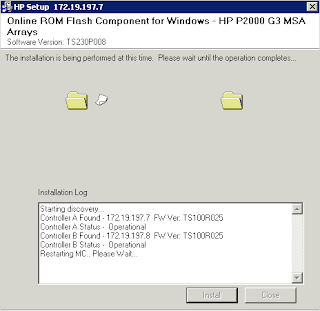 The following post runs through a step by step walkthrough to upgrade the storage controller firmware on a HP P2000 G3, using the Online ROM Flash Component for Windows and the GUI Option. 2) (Optional but recommended) Check support agreements are in place with 4th line – HP Manufacturer – support just in case! 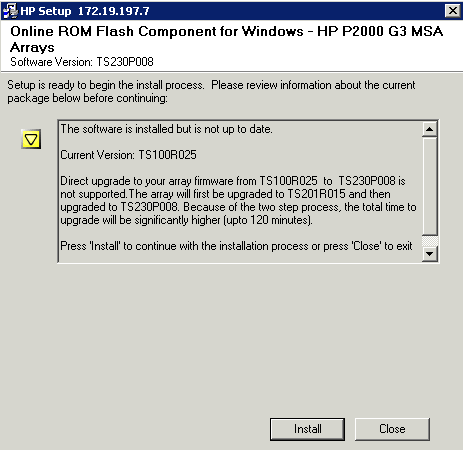 Note: If the firmware is far out of date (like TS100R025 – see below), the installer will automatically upgrade to TS201R015 then to TS230P008. In this case it can take 3 hours for the firmware to apply across the two controllers! 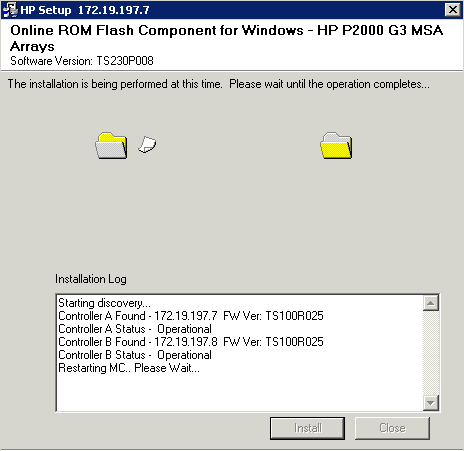 The GUI will post updates from the Installation Log (saved to systemdrive\CPQSYSTEM\Log\MSA2000.log) showing the progress of the upgrade. - does this process also update the firmware on the disks (not all were bought at the same time and they naturally have different versions of firmware - which as I understand is not recommended). If not have you ever done this or can provide some documentation? - I currently have TS201P007 any idea if this is also far out of date? 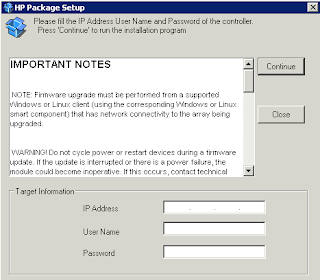 - The process does not upgrade the disk firmware and there are no pre-requisites requiring the disk firmware to be upgraded before doing the controller firmware. 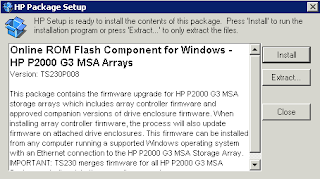 All the disk firmwares can be downloaded from the HP P2000 G3 downloads page at hp.com and the upgrade is done via the SMU. Do you have any experiences with upgrading the disks? 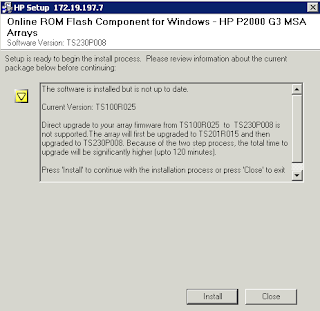 As mentioned not all are the same firmware version and it's recommended by HP that the version is the same on all. One of the reasons I'm upgrading is the fact I'm receiving a "DISK_CHANNEL_DEGRADED" warning from time to time. 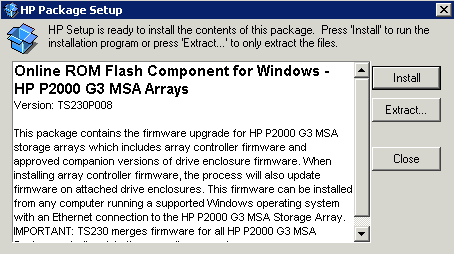 I contacted HP and they said to update the disk firmware (which I'm a bit affraid to do). The reason I asked for the age of TS201P007 is since I'm wondering if it will do a direct update to TS230P008 or an incremental to a version in between (will take a lot more time). I'm pretty certain TS201P007 to TS230P008 will be a direct upgrade. I would recommend double-checking with HP first though. 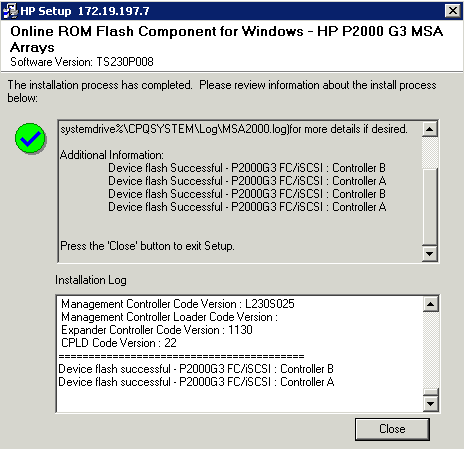 Regards the disk firmware upgrades - I have done in the past for other HP system but not for the HP P2000 G3. It is pretty painless but you do need to be careful with backups available just in case, and will need downtime. Again, I would recommend checking with HP first for any known issues, or best procedure to take. For those that run across this wanting to upgrade from TS201P007 to TS240P004-02 (latest at the time of this post). It is a direct upgrade. Upgrading via the SMU will actually work (ask me how I know, but YMMV), but it is not what is "supported" according to the release notes. I also would not recommend it as you will lose visibility quite often and will be flying blind for a bit as the process takes quite a while. You may regain access to see the event logs but just use the Smart Component updater as supported. 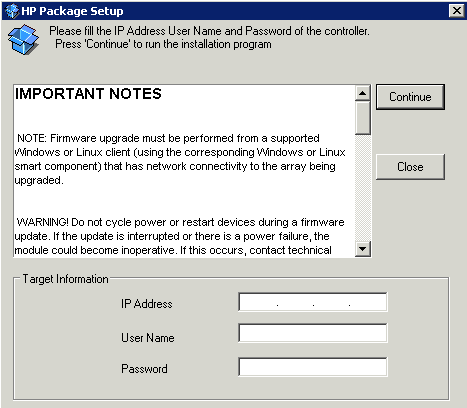 "Using the SMU to install TS240 firmware is supported only when upgrading from TS230 or later firmware. When upgrading from all other firmware versions, install the TS240 firmware using the Smart Component." 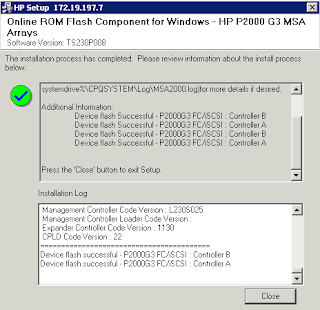 "Beginning with TS230, firmware for all HP P2000 G3 MSA System controllers was merged into a common firmware stream, used on all protocols of P2000 G3 MSA controllers." You will need to do HDD firmware separately. If you tried updating the HDD firmware first while on T201 and was unsuccessful, update your controller firmware first and try again. Use the Smart Component updater rather than the SMU since it gives you real time status updates. Thank you very much for the detailed comment. The information is much appreciated. Hey Cosonok! I really appreciated reading this article. It will allow us to help out our customers in the future if they are having trouble upgrading. If you want check out our site! Great article!!! Thanks for the information! About to upgrade an unused SAN and buy new HDDs to expand the capacity. Considering using SATA drives instead of SAS as I don't need nearline performance for a video archive. I'd love to use SAS, but my budget precludes it at the moment.